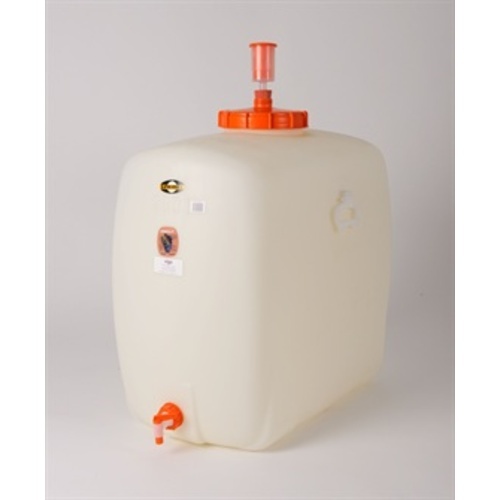 Speidel Plastic Fermenter - 200L / 52.8 gal. The future is here today, and the future is HDPE Fermentation & Storage Tanks from Speidel. Are you tired of carboys? Hate siphoning to transfer? Wish you could ferment larger batches in a single container? Sick of lifting 50lbs by a small metal handle? Done with worrying about shattered glass, injury and lost product? Well then have we got the solution for you! 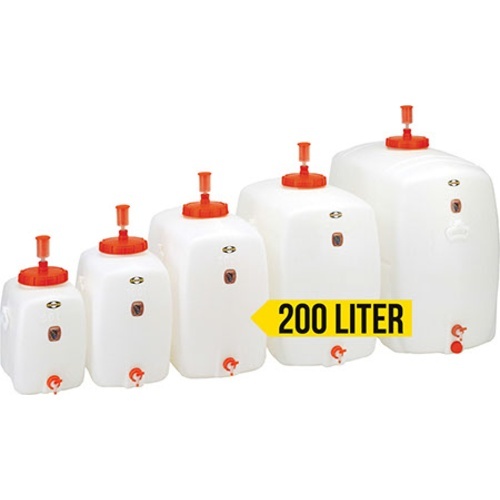 These rectangular heavy duty plastic tanks offer a fantastic fermentation & storage solution at a great price. Heavy duty HDPE construction is durable and resists oxygen transfer. None of the risks of working with glass. Small footprint and rectangular shape makes them easy to store - take better advantage of the space you have to dedicate to wine & beer making. Large lid opening makes them easy to clean by hand - say goodbye to your carboy brush! All ports seal with gaskets and the vessel can be fully sealed for long-term storage. Includes a spigot and oversized 2-piece Speidel airlock. Tired of dealing with carboys. These hold 60 gallons, unless I'm missing something??? BEST ANSWER: The 200L mark is well below the top of the tank to allow for some headspace during fermentation. Full it holds closer to 60, but at the 200 L mark it’s only 52.8 gal. 200L is 52.8 gallons. If you start in a fermenter of 60 gallons, and transfer your product off of the yeast sediment/lees, most likely you’ll end up with enough to fill this storage tank to the max of 52 gallons. James the tanks are clearly printed "200L", which is 52.8 gal. I use them for bulk aging red wine and they work as expected.